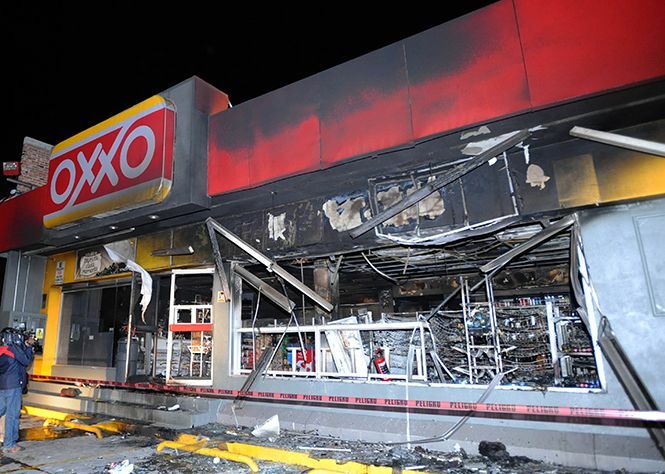 As many as nine branches of Oxxo, Mexico’s most ubiquitous convenience store, were targeted in a series of coordinated attacks on Sunday night. There were no fatalities but at least three people were injured after gunmen opened fire and threw Molotov cocktails at the stores in Hidalgo and the neighboring State of Mexico. Hidalgo’s Public Security Secretary Alfredo Mayorga attributed the attacks to the Knights Templar cartel based in nearby Michoacan. “These organized crime groups used high-caliber firearms, the Templars committed these acts and therefore we must reinforce the Tula area, we are on a state of alert,” Mayorga said on local radio. All Oxxo stores in the region were closed after the attacks which began at around 9 p.m. Many of the stores were seriously damaged and the assailants reportedly stole from the cash registers in some of the outlets. “We understand that the authorities are taking action to restore order and protect the citizens, and we expect this to take place as soon as possible for the benefit of all,” said FEMSA, which runs the prominent Oxxo chain, in a statement on Monday. Coordinated terrorist-style attacks on major corporations are not common in Mexico, but the Knights Templar has been implicated in several similar incidents in recent years. In October 2013, the gang was said to be responsible for burning two dozen electricity and gas facilities across Michoacan, leaving over 400,000 homes without power for hours. The Knights Templar was also previously accused of firebombing gas stations in the neighboring state of Guanajuato in 2012, as well as attacking distribution centers and delivery trucks belonging to PepsiCo subsidiary Sabritas. The Knights Templar is currently locked in a bloody war with vigilante groups and the Mexican armed forces in the troubled state of Michoacan.